Residential service and installation contractors came from all over to attend IHACI’s (Institute of Heating & Air Conditioning Industries) carnival themed annual trade show. AQC attended for the first time, and enjoyed the opportunity to meet many new people within the industry. 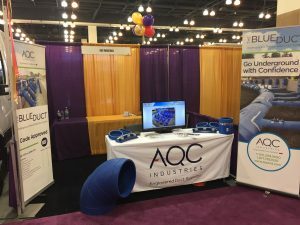 AQC’s team connected with distributors, vendors, contractors and students to share the benefits of AQC’s pre-insulated duct, The BlueDuct. Over 150 attendees stopped by the AQC booth during the day to meet with AQC. AQC’s team shared the ease of installation and performance benefits with those who were new to underground duct work. Part of AQC’s mission is to drive awareness for pre-insulated ductwork as it relates to underground and rooftop applications. This trade show was the perfect opportunity to further educate current and future industry professionals. The amount of students in attendance at the trade show impressed AQC’s Mark Berry. “Most in our industry are aware of the skilled labor shortage we are facing in the future and I was impressed with the quantity and quality of talent from schools that came out to the show”. Students came from CET, UEI, and LATTC, among others, pursuing careers on the technical side of HVAC. Above all, being able to educate students and contractors on the benefits of an alternative air distribution design made the show a blast. AQC looks forward to working with the companies and individuals who attended the show as well as staying engaged with IHACI. Thank you to everyone who stopped by the booth to say hello. In addition, thank you IHACI for putting together a great trade show.